Hoop instructor, custom hoop maker, performer and host of local jams! Who’s Tilly & what’s hooping? 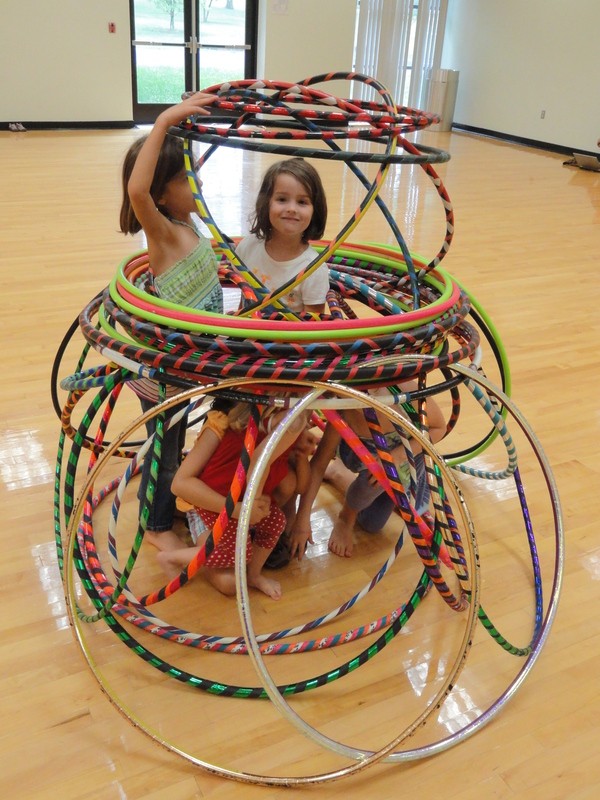 Announcing: New Kids Hooping and Adult Hoopdance Classes for the Fall in Herndon! There are new adult hoopdance and kids hooping classes coming up for the fall session at the Herndon Community Center! Full details are below! If you’ve taken a class before you know it’s a fun way to exercise, socialize and get hoopnitized. Sorry—I couldn’t stop the rhyming! In our adult classes we learn everything from the basics to fun, flashy tricks. We do some chatting and get lost in our hoops and have a pretty great time while burning some calories. Music is upbeat and funky and I tend to play anything from 60s funk to current new and obscure tunes. Check out our sweet double decker hoop fort! In our kids classes we learn some basic, kid-achievable hoop tricks and techniques and play games with our hoops, including making giant hopscotches, obstacle courses, creating hoop forts and more. Music is kid friendly and we’ll sometimes include games such as the Hokey Pokey and Cupid Shuffle in our hooping games. This summer has been a long, busy, hot one and unfortunately I haven’t held many hoop jams since June. The temperatures are getting more friendly though so lets take it back outside to throw down in our lovely circles, starting—tomorrow! I’m moving locations and we’re going to be hanging out at the Herndon Town Green. It’s behind the Herndon Municipal Center (777 Lynn St.). I really liked the skate park and the skaters were fun, but parking was a drag. Downtown Herndon has plenty of parking, the town green is accessible and offers lots of space. The grass doesn’t get too long, there are relatively few bugs and it’s a semi-sheltered location so we won’t have loads of traffic nearby or lots of folks watching from the sidelines. Some folks may wander over, but mostly pedestrians in the area or runners/cyclers on the W&OD Trail. Great location for shy hoopers. I’ve scheduled a few upcoming jams, so head over to the NoVA Spinners Meetup to see all the details! If you’re a beginner, come learn the basics of hoopdance, starting with waist hooping. If you want to expand on your hooping, hone the skills you have or get together to practice and work with other hoopers nearby you’re welcome too! The class starts with a bit of a warm up, we work on anywhere from one to three new moves and spend the rest of the class practicing and jamming out. Hoops are provided in class but hoopers are encouraged to have their own so they may practice at home. The class is five one-hour sessions beginning Sept. 9 and running through Oct 14 from 2-3 p.m. Sunday afternoons at Herndon Community Center. There is no class Oct. 7. This class is for ages 13 and older. You MUST sign up for the entire session, there is no drop in availability because it is operated through the Herndon Community Center. Town of Herndon residents pay $29, non-residents pay $39. Signup for this session begins on Aug. 15 at 10 a.m. for Herndon residents and Aug. 21 at 10 a.m. for all non-residents. IMPORTANT: Registration is through the Town of Herndon. Sign up by clicking HERE. Search for activity number: 2850.101. Hooping for kids will include many of the basic, foundational moves of hoopdance, along with games and more hoop fun. Children can bring their own hoops from home, use one of the instructors, or hoops can be purchased from the instructor. The class is eight one-hour sessions beginning Sept. 9 and running through Oct. 14 from 1-2 p.m. Sunday afternoons at Herndon Community Center. There is no class Oct. 7. This class is for ages 5-12. You MUST sign up for the entire session, there is no drop in availability because it is operated through the Herndon Community Center. Town of Herndon residents pay $29, non-residents pay $39. IMPORTANT: Registration is through the Town of Herndon. Sign up by clicking HERE. Search for activity number: 2850.102. I’ll leave you all with a video done by some of my favorite hoopers up in Maine! Ever since I began teaching hooping people have been requesting children’s classes. My current classes are 13+ only for a few reasons, but I kept saying that perhaps in a year I could do a teacher training to be able to teach children’s hooping classes. I got that request tonight that finally pushed me to commit to doing it! Tonight I signed up for BodyHoops’ Fit Kids Distance Teacher Training. And I’m really excited to be able to confidently add children’s classes to my repertoire. Part of me thought, “Hey, you have a lot of skills to share. You can probably do kids’ classes without training.” However, I’m not that great with kids. I’m getting better, and hooping helps tremendously, but I was one of the youngest in my family, didn’t babysit and wasn’t around other small children much growing up. I’ve always been uncomfortable around children. I’m hoping the BodyHoops program can give the confidence, skills, games, ideas, tricks and tips needed to make me more comfortable in the hoop with kids. It’ll also be greatly helpful for doing children’s hoop parties. I think if I’m getting to the point where I’m excited to be around kids because it gives me an excuse to be in the hoop, then I’m definitely ready to do the teacher training and take on kids’ classes.